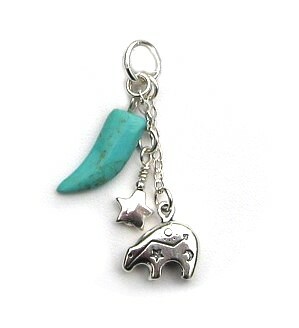 Utterly charming cluster pendant, complete with Sterling Silver Bear, Star and Turquoise Bear claw. In Navajo legend, the Bear is a symbol of inner strength and great knowledge. Bear is also linked to power, because he can stand on two legs like a man, thus he is seen as a good mediator between animal spirits and humans. Wear on its own on a chain. Or clip onto an Affirmation ring for even greater impact. For a chunkier look add more Spirit Charms.